Ecole Hoteliere at Lavasa- Say Cheers! LEH is delighted to announce its strategic partnership with the Institute of Wine and Beverage Studies (IWBS) which will allow the institution, for the first time in its history, to offer its students a range of prestigious qualifications in Wine and Spirits. These qualifications, awarded by one of the most reputable international bodies in the field of wines and spirits education - the Wine and Spirit Education Trust (WSET®), London - will bring to the campus in Lavasa three levels of Certificates (level 1, level 2 and level 3) that will help train students in the exciting world of wines and spirits, giving them the skills and knowledge they need to help them become leading professionals and entrepreneurs in the wine, food and hospitality fields. 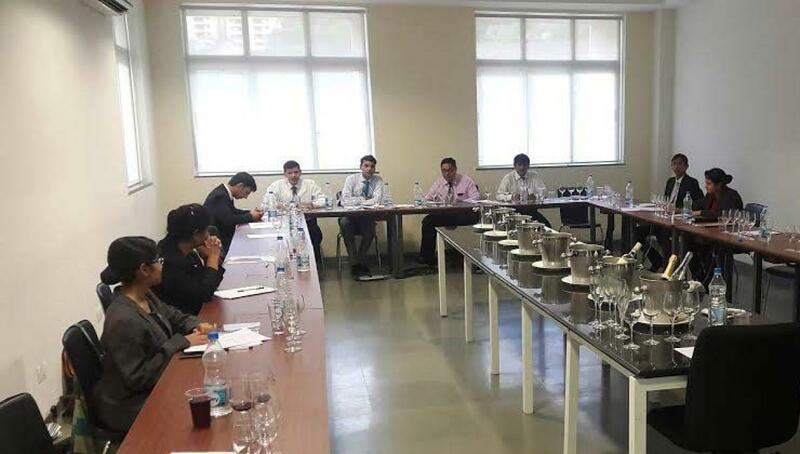 The LEH campus at Lavasa had a two-day workshop in Level 1 of Wine and Spirits knowledge, in the first half of this week, conducted by Mr. Gagan Sharma, a certified Sommelier from the esteemed Wine and Spirit Education Trust (WSET®), London. He introduced wine tasting and food pairing to the participants- our students and facilitators. The participants for the programme tasted a wide array of wines from around the world, Including Sauvignon Blanc, Shiraz, Riesling, Pinot Gris, Chardonnay and many more. It made them understand the concept of blind-tasting, food-paring and understanding the background of wine making. This gave a wholesome experience to the students and the facilitators. The technique of teaching wines by Mr. Gagan Sharma was a unique way in which he would relate the wine’s flavors with daily routine items which made it easier to understand wines. He also shared a lot of his anecdotes from his several travels around the world. He shared the purpose for his passion towards wines and also his love to travel around the world. The students got an absolutely new outlook towards the wine industry which facilitated them to gain confidence to talk about a wine as being a front of house staff. With the help of food pairing students experienced not only amazing flavors but also bad food paring to understand which wine to recommend a guest according to their food preferences. This program gave new outlook for selling wines to guest and appreciating different wines around the world with the help of this program. The WSET® qualification will be built into the curriculum offered at LEH and will offer three levels of certification from the basic to the advanced. WSET® Level 1 Certificate in Wines - This Certificate offers a basic introduction to main wine styles of wines available to front-line staff involved in the service or sale of wine. As part of this course students will learn to taste and analyse wines in a systematic way and will work with up to 15 international wines. WSET® Level 2 Certificate in Wines and Spirits - This Certificate offers a more advanced study of wine styles, production methods, wine labels, food and wine matching principles, and systematic tasting, working with up to 40 international wines and spirits as part of the course. WSET® Level 3 Certificate in Wines and Spirits - This Certificate offers a more comprehensive coverage of the wines and spirits of the world, with an increased focus on tasting techniques, thus giving students the opportunity to learn about the product’s style and quality. The introduction of WSET® qualifications in the curriculum at Lavasa marks another milestone in the history of the institution and provides yet another indication of the growing reputation of the LEH, as a hospitality management institute of choice that offers its students a unique learning experience and high quality standard of education. This is indeed an exciting opportunity for the students at LEH to gain a qualification from one of the world's leading bodies in wine and spirit education.